….that is until a sheet is removed from a bathtub I hadn’t noticed in the far left corner. 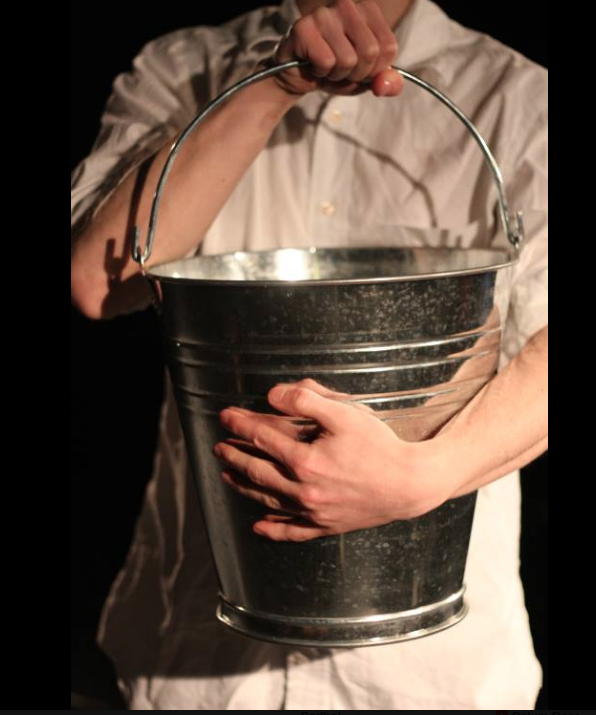 In the play’s own words ‘A kettle is hottest when it is silent’ and indeed, Bucket Men felt blisteringly engaging in the long, silent wake of its horrific bathtub reveal. All whimsy is swiftly shattered, and an oppressive chill takes its place. The characters simply sit eating sandwiches, while I’m forced to make sense of this unsettling scene. It’s a glittering moment of tension and morbid delight that successfully grips the entire audience. From there, Bucket Men doesn’t hold back, becoming an exercise in anxiety as A and B attempt to recreate their work day, word for word, over and over again. What keeps this repetition from becoming boring is that the characters seem to know that changing the pattern has violent consequences, and react fearfully at any misstep. Thus, the circular scenes feel woven into the plot of the piece itself, becoming less a poetic gimmick and more an interesting necessity. This is best utilized in the latter half of the piece when one of the actors must recreate the work day all by himself. What results is an impressive display of acting prowess from Max Aspen, and a gorgeous way to ramp up the boiling tension Bucket Menproduces. However, while Bucket Men effectively builds tension and uncertainty for the majority of its run, I can’t help but feel a little cheated when the production ends and I’m left with little to no answers. While I understand an absurdist and surrealist piece typically lends itself more to interpretation, the ritualistic tasks the men go through feel too specifically tailored to the world of the piece to simply be metaphorical, or without a specific reading in mind. Nonetheless, this work of new writing from Samuel Skoog manages to win me over, despite my bias against ‘art-for-art’s-sake’. Ultimately, In a festival over-saturated by shows featuring ‘relatable content’, I’m glad I instead got to spend an evening outside of the confines of my own reality. Bucket Men is on at 5:45 everyday in C Royale till the 18th of August. here at the Fringe, we are branding and re-branding ourselves in the hope of eliciting some praise from strangers (and in some cases our mums.) “Why is nobody filming me? !” cries Duffy, echoing the generational subtext that permeates this fledgling century. Tonight, With Donny Stixx is a reality check for all of us. For performers, it should be even more impactful— the bar is set very high indeed. 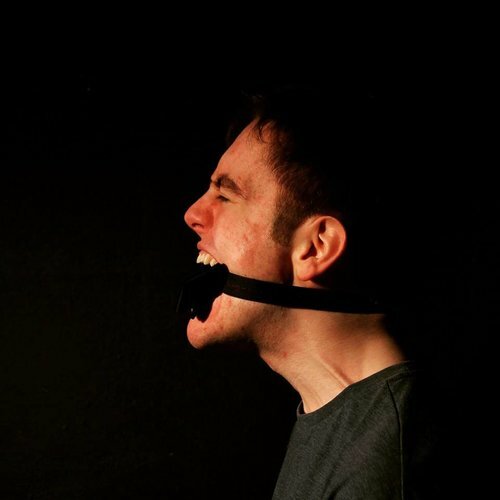 Tonight, With Donny Stixx is on from the 13th -25th of August at 13:40 in The Space at Jury’s Inn. I encourage everyone to go along and see Chris Duffy’s masterful iteration of this show; his bouts of believable mania and sudden wrathful outbursts bring a largely empty stage to life, and Donny’s life is not fair. The beer garden at C Too is adorable. There are hanging light fixtures, exposed wood furniture and abundant foliage. It’s a nice reprieve from the hustle and bustle of Fringe madness, characterised perfectly by the queue for the Tattoo swarming outside. To Have Done With The Judgement of God plunges you into an entirely new kind of madness, substituting the placidity of C Too’s garden for droning electronic beats, haze and atmospheric lighting. FNC love to shock, so a stark juxtaposition to the tranquillity outside was to be expected. Such conceptual theatre is hard to review. Our interpretation might not be the same as the intention of the piece, or even the opinion of other audience members. While our experience would suggest that FNC intended an environmentalist reading for THDWTJOG, to allow for subjectivity we’ll try and keep our critique focused chiefly around realization, delivery, and the production’s technical elements. THDWTJOG is based on a radio play by Antonin Artaud, the text of which is left completely open to theatrical interpretation. In FNC’s iteration, they have chosen to complement Artaud’s words with physical theatre, utilising an array of rich choreography. This was most effective during the piece’s opening sequence, we felt—the steady pacing and minimal light sources lent the prior scenes a ritualistic, eerie quality. Moreover, the highlight of THDWTJOG follows shortly afterward; naked cast members spill out of a plastic “womb”, and writhe on the floor in an infantile stupor (the symbolic implications of which were not lost on the audience.) Artaud might have been proud of the play’s use of sonic elements too; the score is wrought with metallic whining, crashing and other similarly terrifying noises. Admittedly, one soundscape in particular felt slightly played out by the conclusion of the piece, but this is a personal gripe. As for the performative aspects, some sequences felt more disorienting than effective. The physical theatre and Artaud’s manic rambling can feel, at times, to be working in opposition. Words are lost, attentions are split and what starts off as a captivating, weighty piece of theatre begins to lose its edge. FNC expects the audience to simultaneously engage with the postulations of a madman and interpret the high octane physical sequences we’ve come to expect from them. It’s overwhelming, which could perhaps be intentional, but ultimately serves to confuse the spectator. Our feeling is that THDWTJOG would have benefited from focusing more on the physical interpretation, trading the total integration of Artaud’s radio play for a few select lines in between the sequences. This at least would have remedied the sensory overload. That being said, the physical theatre on display was of iridescent quality. We suspect the cast to include at least one trained ballet dancer—the timing and precision of each sequence was impeccable. We’d recommend anyone unsure of the expressive limitations of the human body to check out THDWTJOG, as its cast consistently seek to challenge them. To Have Done With the Judgement of God is on at the C Too Venue everyday till the 27th of August at 20:15.